Crusading to promote high quality historical fiction! There are times when you come across a book that piques your interest, especially when its subject is one you are very interested in learning about. You know there will be some artistic licence, but you want the story to as factual as it possibly can and also entertain you. 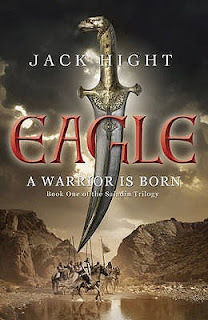 Jack Hight has done all of that with a truly majestic account of the early life of Saladin, the Muslim leader who nearly united the whole of Outremer and nemesis of Richard the Lionheart. The author has researched the era and locations with extreme detail and, in his notes, demonstrates the amount of time and care he has taken to make the book as historically accurate as he can. He admits to merging two incidents into one and I admire the way he weaves the fictional characters around the true life figures. I have to say, the book surprised me. Being very keen on this period in history, I have been extremely disappointed by some books that make claims of historical accuracy and extensive research, when it is blatantly apparent that facts have been manipulated to tell a story. Now, I think any fan of HF will accept that to a certain extent but so many poor stories have been written that separating the wheat from the chaff can be very difficult. Jack Hight has done a marvellous job with this work. the characters come to life, the descriptions of the locations and tensions that occur due to the perpetual turmoil of war are nothing short of genius. This is one story I highly recommend, I do not give 5 stars unless a book grabs me by the short and curlies and doesn't let go. It is close to that, but not quite. A worthy 4 Crosses - I cannot wait for the second instalment! I love Saladin's story! I completely agree that there is too much crap out there masquerading as HF. Hope this blog goes well! Being interested in that era myself, it's now on my TBR list. Thank you. Great and inspiring review Stuart. I want to read this now. buy from my Amazon Store! "Do not tell me the moon is shining; show me the glint of light on broken glass." Anton Chekov. I am now holding Court on Facebook!